In the autumn of 1879, following on the heels of their London triumph of their enormously successful hit operetta H.M.S. Pinafore, William Gilbert and Arthur Sullivan traveled to New York with members of their British company to stage an "authorized version" of that piece; Pinafore had not debuted in the U.S.A., and consequently, under the copyright laws-or lack thereof- which operated in this country at that time, some eight pirated productions of the operetta had appeared in NYC, not one of which was faithful to the London original nor paid any royalties to the show's two creators. Determined to show New Yorkers "the real thing"- and to reap the financial rewards that were falling into the pirate producers' laps, G&S astounded New York society by the high quality of their "authorized" Pinafore, which promptly put all the pirated versions to shame. What New York audiences didn't know that fall was that the daring duo were secretly rehearsing a new operetta, intending to secure its American copyright by opening simultaneously in Britain and New York. 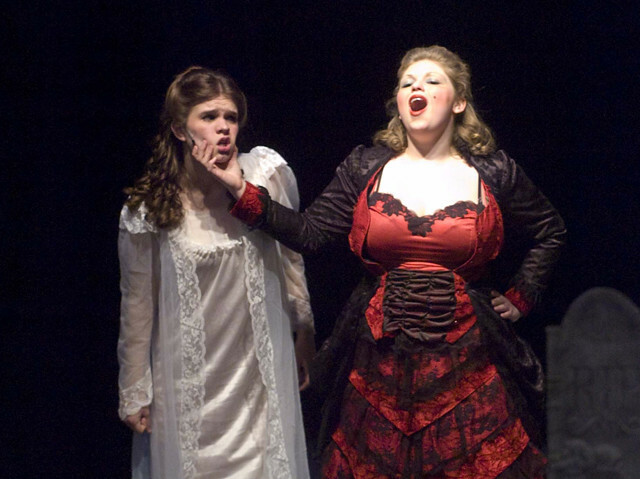 The resulting new work, The Pirates of Penzance, also became an instant smash hit, and we bring it to you tonight. Pirates has become one of the international musical theatre's most beloved classics in the nearly a century and a quarter since its NYC opening on New Year's Eve,1879. 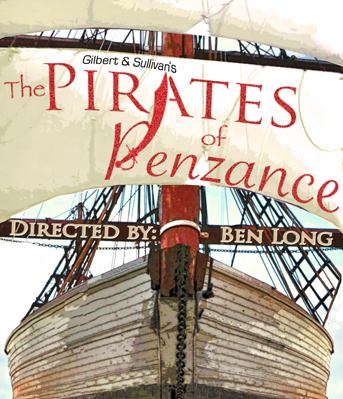 Following Gilbert's formula of "treating a thoroughly farcical subject in a thoroughly serious manner," the show's plot about a group of overly tender and sentimental pirates who try to kidnap the numerous daughters of a British major-general for the purposes of lawful matrimony, when wedded to a splendid score from Sullivan that lovingly tweaks the conventions of Italian opera, make Pirates the very model of a modern merry musical. In its own day, Pirates' characters and dialogue poked fun at the sacred cows of Victorian behavior and morality and gleefully lampooned everything from British imperialism and the real-life redcoated heroes who enforced Queen Victoria's rule over 1/4 of the earth's surface, to the "protect and serve" ethics of the British police, to the 19th century Englishman's obsession with "doing one's duty" regardless of the cost (the actor George Grossmith, who originated the role of Major-General Stanley,actually made the role into a comic impersonation of one of good Queen Vic's most celebrated officers, the so-called "scientific soldier" Sir Garnet Wolseley, who led successful campaigns in Canada, West Africa, and Egypt in the 1870s and 1880s.) The show's musical and comic delights, however, have transcended its topicality and made its songs and catchphrases beloved over a greater area than Victoria ever ruled. I must confess that The Pirates of Penzance is a personal favorite of mine; having played the Major-General in a production back in the 1980s and done dramaturgy for several other productions, it never fails to entertain me. My G&S performance experiences started at Lebanon Valley College in the 1970s in a production of their rarely performed last operetta, The Grand Duke, under the direction of a young LVC alumnus, Tom Hostetter, now acknowledged as one of the northeastern U.S.'s masters of presenting G&S, so with tonight's show I return to my theatrical roots. On behalf of Ben Long and the whole Wig & Buckle crowd of student actors, musicians,technicians, and front of house staff who've spent the last year planning and the last five weeks building, rehearsing, and marketing this visit to the rocky coast of a G&S Cornwall, I hope that tonight you will-if you aren't already a G&S aficionado-join the millions worldwide whose affection for this lovely musical comedy has transformed it into an enduring legend in the world of the theatre.